This first unit of study in our first year of high school, was to examine the idea of The American Dream. 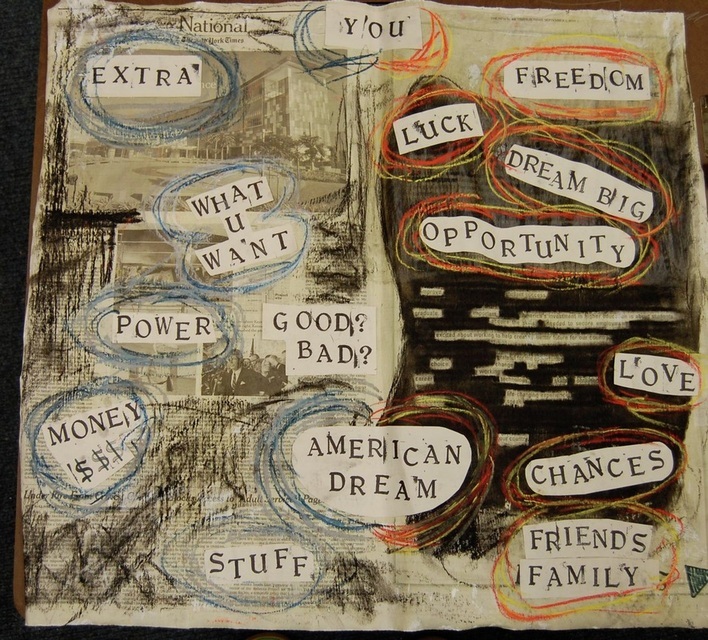 During this project we approached the idea from several different directions: below you'll find an art piece that I made to explore society's view of The American Dream, and an artist's statement below that, detailing my thought processes. Additionally, we had to conduct an interview with someone about their American Dream, and compose an essay on their responses and what we'd learned in the unit. I interviewed Claus Lund, an American immigrant from Denmark. On the first day of school, we began discussing the American Dream and what it means to us. We had an essay to write on our opinion. It was then explained that we would be conducting interviews so that we could see others' views on the same topic. After learning a lot of interesting views on the American Dream, it was time to start our interviews. I interviewed a bunch of different people. At a party, I put out the questions I wanted to ask, and everyone answered them. In this way, I received almost a whole page of notes, just on what other people thought of the American Dream. But then I interviewed one of my father’s co-workers, who had come to America from Denmark, a place that seems MUCH better than America. After conducting the interviews, we started art projects, centered around someone’s view on the American Dream. I made mine the combined interviews of everyone at the party. They all believed that the American dream was something that could either not be achieved, or that it was a fake, something that does not actually exist. My project was made with a newspaper, painted white on one side, and decorated on the other. I decorated the side to look like the two conflicting ideas of the American Dream- materialistic success and the ideas of American ideals, opportunity, freedom, etc. One side has the words of success stamped in black letters: money, stuff, extra, what you want. The other side has the ideals, freedom, opportunity, and family. Everything is stamped in black letters. (I liked using them so much, all my words ended up being stamped.) I then outlined everything in colorful pastel crayons. All in all, I like the result I came out with, and I hope we can keep working in the art room for American Studies. In many world surveys and statistics, Denmark is cited as one of the happiest and most comfortable places on the planet to live. The government there gives the residents almost all the benefits that Americans are working so hard for: universal healthcare, free college education, less work per week, and much more vacation time. To Americans of today, our ‘willingness to work hard’ is working as hard as we can to pay off our debts. The Danish society is handed everything the Americans are working so hard to get. Does the Danish society have their own Dream by default? Claus thinks so. He says the Americans all have goals that require work and effort, whereas the Danish culture has everything that they really need, so they don’t have many far reaching goals. "Of course,” Claus says, “there’re still plenty of people who strive to do more and do better, (the Danish society wouldn’t be as wealthy if those people weren’t present), but a large section of the population are happy and comfortable by default, and don’t need to do anything special.” This seems like the true American Dream, a life where you can sit back and actually enjoy what you worked for, whereas the average American worker needs to keep working just to be able to afford health care. When asked if he had achieved the American Dream, Claus said, “I think I have… At least to some extent. I'm comfortable & happy with my life.” Of course, he also assures us that the ‘Dream’ is not necessarily something with an end state. You can always strive for more and you can always do better.